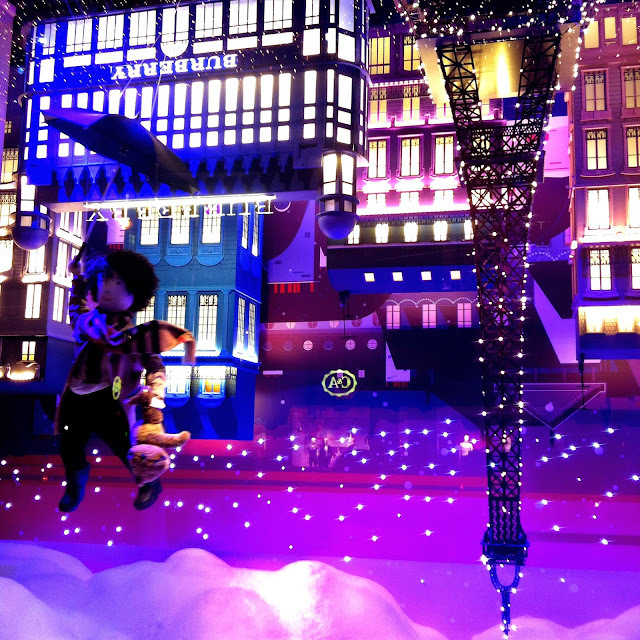 One of the things I love doing during the Christmas period in Paris is taking a day out to leisurely stroll through my favourite Christmas themed department stores. 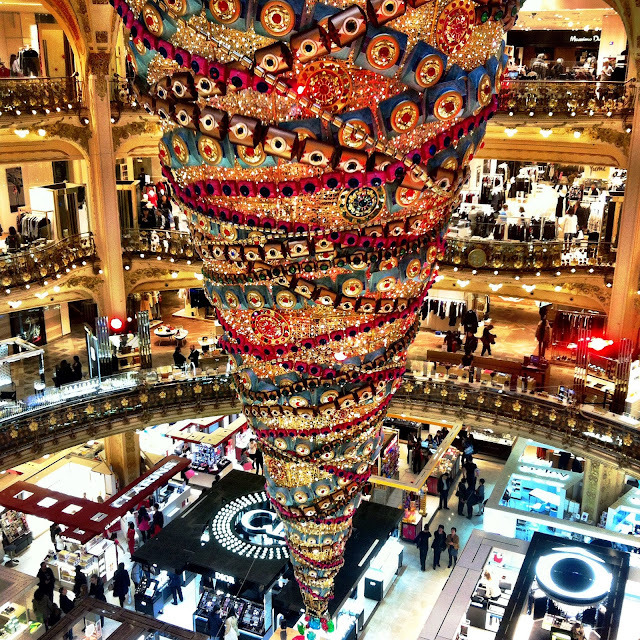 Parisian department stores also offer free Christmas gift wrapping which is a bonus when working through the Christmas present shopping list! 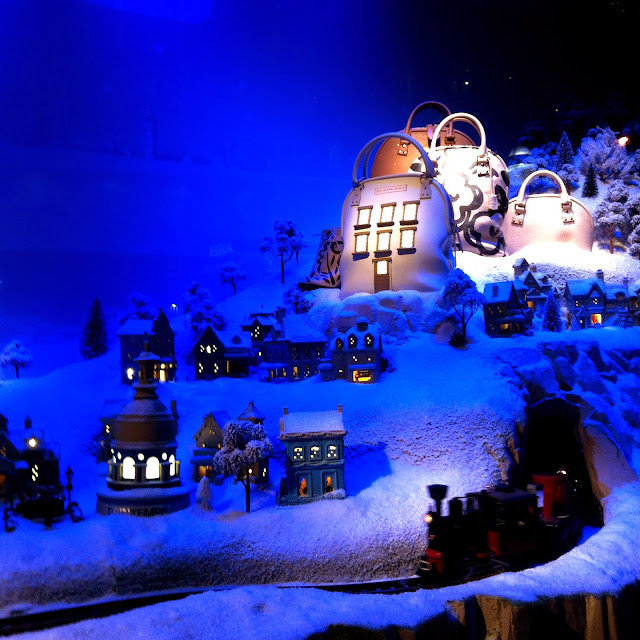 By the time evening falls, which in Winter is around 5pm, it's time to pop outside and hit the window displays. They look extra magical and twinkly at night. 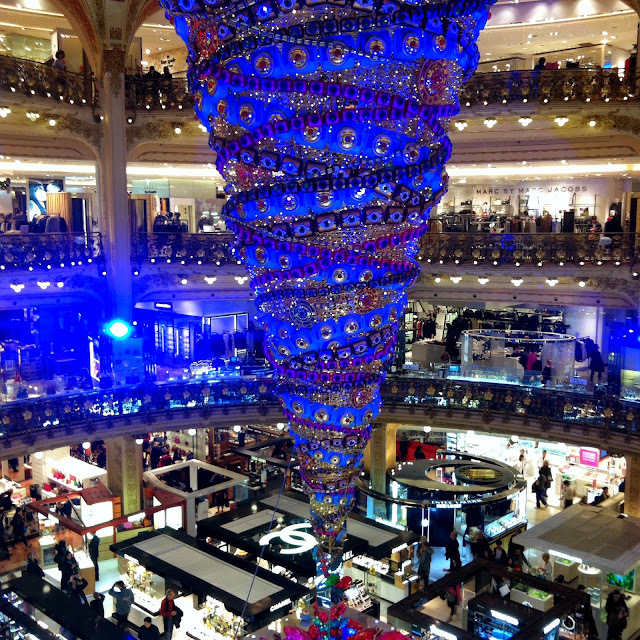 First cab off the rank this year was Le Bon Marché to see this giant centrepiece suspended in the middle of the store. You know Dasher and Dancer.. Founded in 1838 as a small shop, Le Bon Marché officially became a 'department store' in 1852 when Aristide Boucicaut and his wife Marguerite decided to create a new type of store that would revolutionise the customer shopping experience. My Love for Paris tip: Be sure to check out the window displays as well as La Grande Epicerie de Paris, the famous Parisian food hall..! 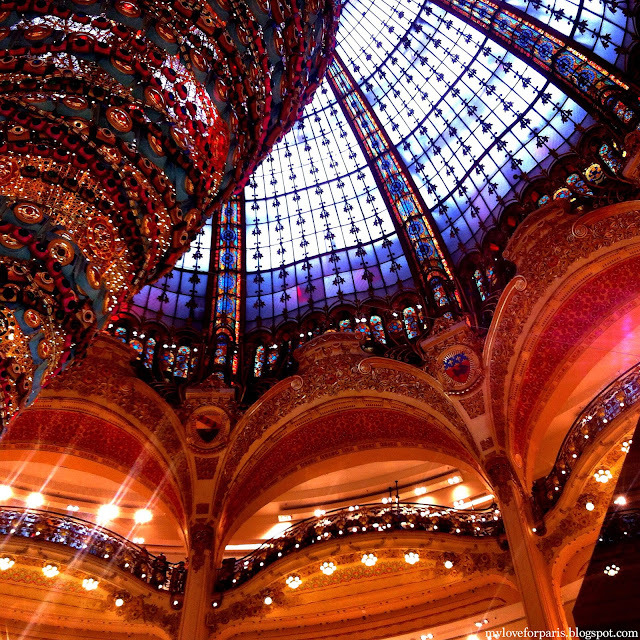 Galeries Lafayette is without a doubt the most famous of all department stores in Paris. Relatively new compared to Le Bon Marché, cousins Théophile Bader and Alphonse Kahn started up this current Parisian shopping icon by opening up a small fashion store in 1895. 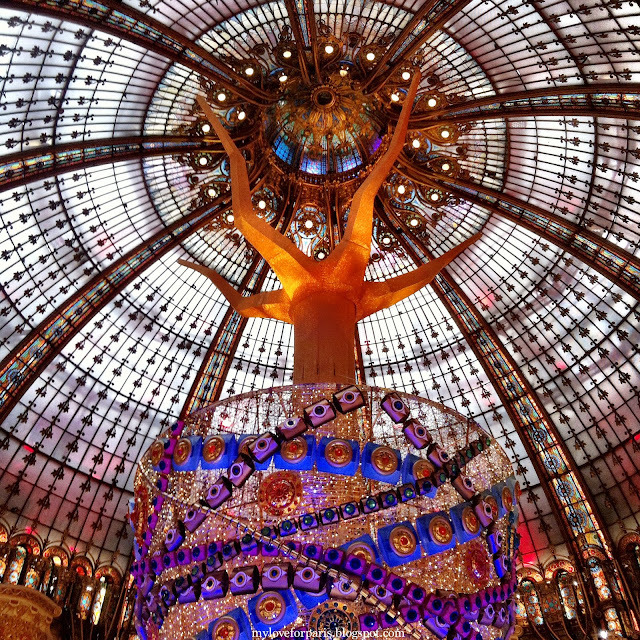 Galeries Lafayette never disappoints at Christmas time. This year's centrepiece was a 25 metre upside down Christmas tree, suspended from the famous stained glass dome built in 1912. 1. Be sure to check out the newly renovated Food Hall which is across the road at Lafayette Maison and not with Menswear as before. 3. If visiting between May and November, be sure to head up to see the free rooftop views on the top floor. 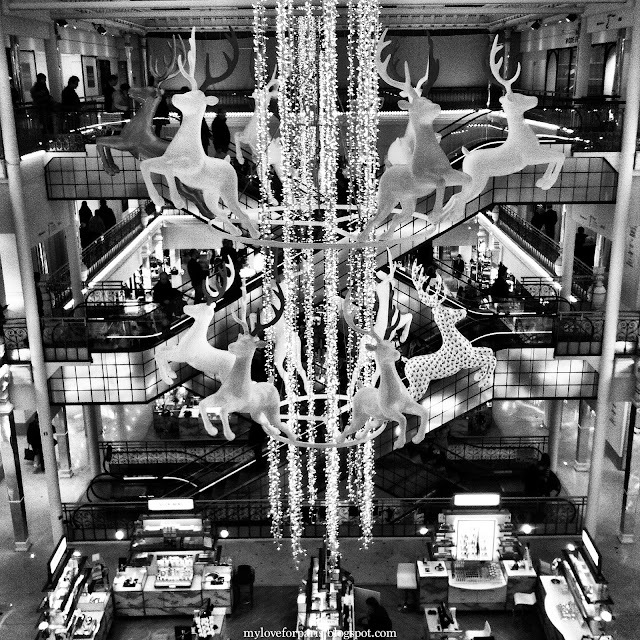 Another department store not to be missed is Printemps, which was founded by Jules Jaluzot and Jean-Alfred Duclos in 1865. Interestingly enough it was one of the first department stores be connected to the metro almost 40 years later in 1904. I probably enjoyed their window displays the most this year. Lafayette had some monster theme going on which just didn't do it for me. Mesmerised by the twinkling lights and marionettes dancing around, I clamoured my way to the very front to get some snaps. Don't worry, no children were harmed in the process. 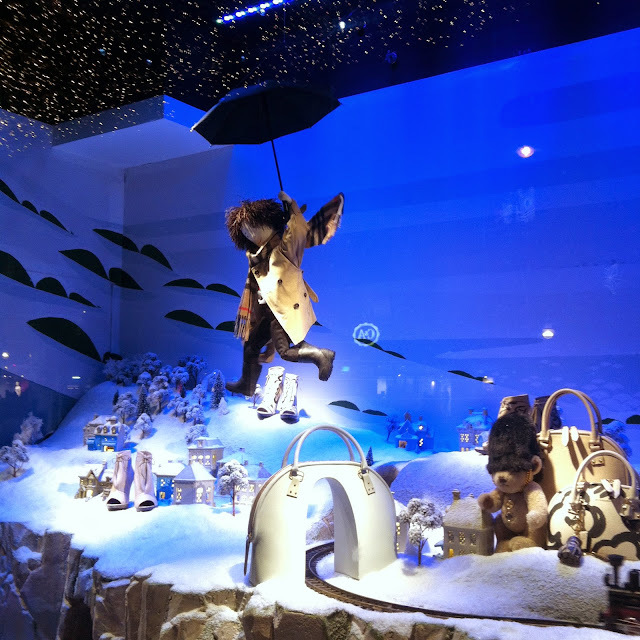 Their window displays (although blatantly sponsored by Burberry this year) were cute if you mentally blocked out all the merchandising and product placement to just focus on the more traditional elements of Christmas. I watched this train over and over again..
Upside down Eiffel Tower to match Galeries Lafayette's upside down Christmas tree? 2. Beware of using the restrooms here, they cost a whopping 1.50€ when it is free just next door at Galeries Lafayette! 3. Check out the Brasserie Printemps for another pretty dome. Merry Christmas from Paris everyone! Thank you Cassandre! Paris is very photogenic this time of the year..! What is with the coffee in Paris...?